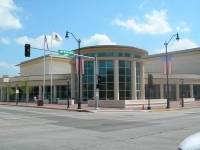 The Abraham Lincoln Presidential Library opened in October 2004, with the Museum opening the following year. They are part of a $115 million complex dedicated to the life and legacy of Abraham Lincoln and form the largest presidential library complex in the nation. The library houses the world's largest collection of Lincoln material, with more than 46,000 items. Included in this collection are nearly 1,500 documents written or signed by Lincoln, including handwritten copies of the Gettysburg Address and the Second Inaugural Address. The collection also contains important family documents and artefacts, such as the Lincoln's marriage license, a tablecloth from their wedding reception, the nameplate from their front door, and Mr Lincoln's shaving mirror. The museum has been designed to be an immersive experience, using creative exhibits which take visitors through phases of the president's life from his boyhood cabin in Indiana to his 'homecoming' funeral in Springfield.